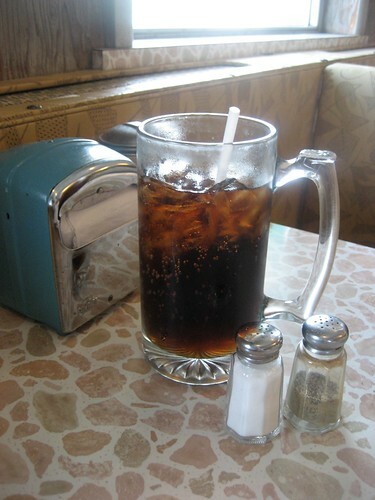 When we first moved to our town we were smitten by the flashy exterior of a vintage diner only to be disappointed on more than one occasion by the food– reminding us that you shouldn’t judge a book by its cover. Taking those words to heart, one day we thought we’d try an intriguing but somewhat plainer looking restaurant up the road, The Fisherman. And BOY were we in for a treat! Now, I will say up front that not everyone who has visited it “gets” The Fisherman, but since you’re here reading Retro Roadmap, I think you will appreciate the charm of the place. Opened 1960, The Fisherman was built by the father of the folks who run it now. He was the original Fisherman, according to his daughter Laurie, who says her dad would go to the Chesapeake and fish, bring his catch home to PA, clean it and serve it at the restaurant. While fish and seafood still feature prominently on the menu, it also includes many standard diner food staples- my ultimate fave being the chicken croquettes (with a side of pickled beets, please). While not fancy we’ve always been pleased with what we ordered, and it is definitely much better than the food we had at the shiny diner. They are also famous for their pies, especially the strawberry, though I am usually too stuffed to get dessert. 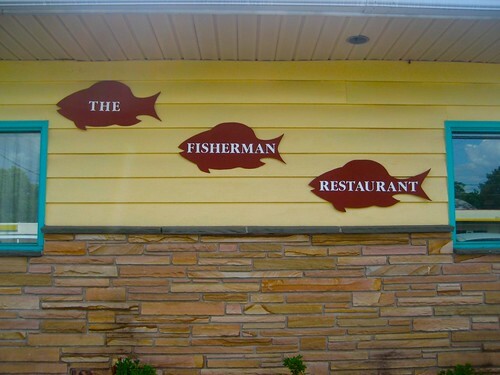 Besides the comfort food, the best thing ever about The Fisherman is the décor. For the most part untouched since the place opened, it is a beautiful study in preserved materials, patterns and textures. This combination is kept tastefully in check by an overarching neutral palette, allowing everything to serenely co-exist and not clash. A visual feast from the linoleum floor to the recessed ceiling with its leafy light fixtures, the place is well kept and well cared for. 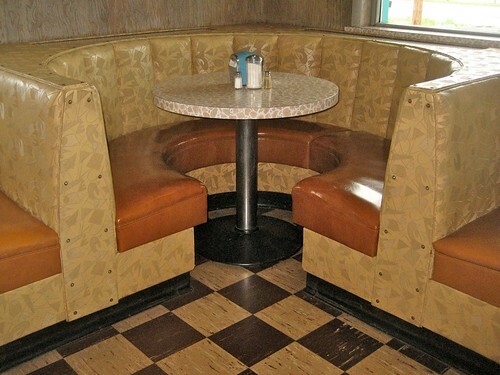 The Booths! Each one hand made by the original Fisherman, including the round one in the corner (my fave!) We are all lucky that they are custom sized and cannot be easily replaced by cheaper modern versions. The mocha colored vinyl is patterned with a jazzy intersection of swerving lines and abstract geometrics, busy without being overwhelming. The Counter! 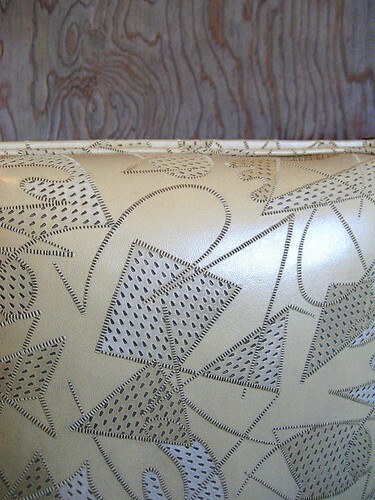 Vintage Formica with a sandy stone motif on a white background. 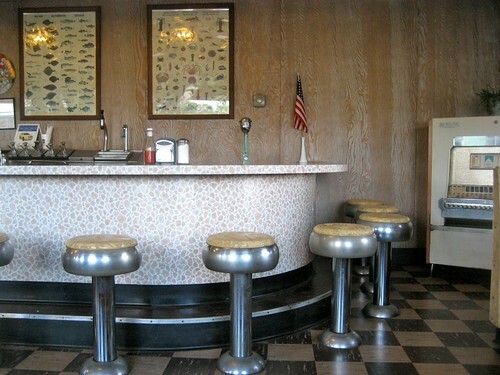 Swively stools overlook a soda fountain setup, where your drinks are still made by mixing syrup and soda water. The cash register is solid silver chrome, as is the pie case. Trust me and don’t miss the signs on the restrooms. 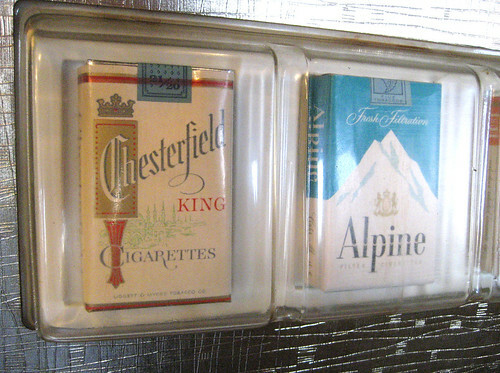 Oh and did I mention the cigarette machine that advertises brands that don’t even exist anymore? Can you see why we love it so? First of all, it is a very quiet place, with soft music playing in the background, and frequented by older folks. Please don’t be boisterous or loud, it just ruins the whole vibe. Second- splurge and get yourself a large soda. They come in oversized mugs and are mixed to order behind the counter. Lastly and most importantly- Please let Laurie know how much you love the decor and appreciate the fact that she and her brothers have not made any changes to it. It definitely takes the place from beige to beautiful. Please also let them know what a treasure they have on their hands, and that it is one of the reasons you came to visit. I’ve said it each time I’ve visited, but they could think I’m just an odd broad. So add your voice to the chorus of support for how cool the place looks, so they don’t think of “modernizing” the place. Horrors! Hey gang, despite the rain I got some pretty good night time neon shots at the Hilltop in Sanatoga, and added them to the original post. Click to see it in context. 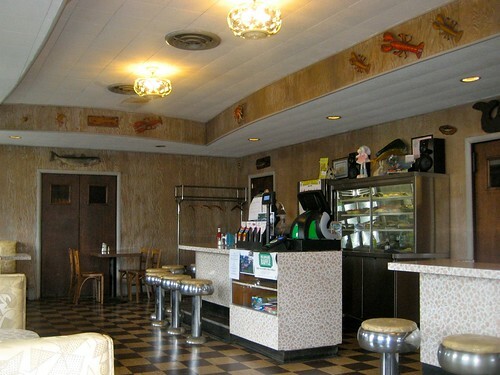 Located smack dab between Pikes (Germantown and Ridge) in Collegeville PA, Speck’s Drive In has been serving up tasty food since 1964. There are signs on either Pike to guide you into their parking lot, and interestingly no signage on the building itself, which is reminiscent of a small Howard Johnsons, but with a red and white color scheme. The signs are beauties though, and would make any Retro Roadmap fan detour immediately to investigate. There are other things on the menu, but you’d be foolish not to go for the chicken, at least on your first visit. If you feel the need later to branch out there are sandwiches and hoagies as well. Belly up to the counter, place your order and wait for your tray. And oh, that chicken! Sold by the piece (individually or in buckets, up to 100 pieces or more) it is crispy on the outside, moist on the inside- what more could you ask for? I recommend ordering a dinner as I’m a sucker for the not often seen crinkle cut fries, and theirs are excellent and fried up nice, not mealy or flabby like some fries. This triple threat of signage, food and decor put Specks at the top of my list, and it’s open year ’round so you can get your fix any time. Up Germantown Pike just feet away from Speck’s awaits a great photo op at the Pit Stop go cart/mini-golf. Howzabout that big honkin Twisty Treat cone –you don’t see them every day! It is one of only 2 that I have seen in PA- my parents took photos of a bunch of them for me when they were in Florida years ago, so it’s always surprising when I see them elsewhere. Here’s some interesting info about Twistee Treat from Roadside Architecture goddess Debra Jane Seltzer, she’s just swell! If you’re lucky enough to be there on a Wednesday evening you may run into a friendly bunch of self-proclaimed misfits sitting in their lawn chairs and showing off their classic and custom cars. Stop to admire the chrome and craftmanship on these old gems, a perfect way to enjoy a warm evening. I love using these viewers whenever I see them, and am a fan of the solid design and almost human face of it. Does anyone know what the history of these things are? I don’t even know their official name to search for it? UPDATE! My friend Lori says they’re simply called Coin Operated Viewers*! Thanks to her I was able to find out that the ones I love the look of have been made for the last 75 years by the Tower Optical Company of Norwalk Connecticut! * OR you can call ’em viewfinder, viewing machine, viewing scope, viewing stand, outdoor viewer, tower viewer, scenic viewer, coin-operated binocular viewer, coin-operated viewfinder, coin-operated viewing machine, coin-operated viewing scope, coin-operated viewing stand, coin-operated outdoor viewer, coin-operated tower viewer, coin-operated scenic viewer, non-coin operated binocular viewer, non-coin operated viewfinder, non-coin operated viewing machine, non-coin operated viewing scope, non-coin operated viewing stand, non-coin operated outdoor viewer, non-coin operated tower viewer, non-coin operated scenic viewer, free-use binocular viewer, free-use viewfinder, free-use viewing machine, free-use viewing scope, free-use viewing stand, free-use outdoor viewer, free-use tower viewer, free-use scenic viewer…! From our New York bureau, ace reporter Suzanne Sullivan McGillicuddy has sent us a few of her NY faves. Thanks Suzanne! This is my favorite dive bar in New York – located in Hell’s Kitchen. It opened in 1933 – not long after Prohibition had ended. Don’t let the “grill” in the title fool you…there’s no menu or grill, but they do always offer free hotdogs and cheap beer. Although some marketers are now trying to call the neighborhood “Clinton” – it will always be Hell’s Kitchen to me. Picture the Sharks and the Jets dancing between the buildings – parts of the neighborhood haven’t changed at all despite the “Disneyfication” of Times Square which is close by. If you’re coming to NYC to check out a Broadway show, venture over to 9th Avenue and look for the giant pig statue outside Rudy’s door – he’s currently sporting a mask to protect himself from the Swine Flu. Try to get a seat at one of the red vinyl booths that have more duct-tape on them than vinyl these days. Otherwise belly up to the bar for a beer or whiskey. You’ll be disappointed if you’re looking for a glass of wine or a Cosmo – they are not to be found here. As with any good dive bar, you are taking your chances in the bathrooms, use at your own risk. Until recently they had one of the best jukeboxes around, but it has been “upgraded” to one of those internet things – boooo! Despite the new jukebox – this is definitelly worth a visit when in NYC. Retro Roadmap correspondent Suzanne Sullivan McGillicuddy offers up this Maine shack for a retroroadmap seafood stop. Modbetty digs the crinkle cut fries and vintage viewer! Whenever visiting friends in Portland during the warm weather months, I make every effort to take a trip out to the Lobster Shack for some fresh lobster or full-belly fried clams (mmmmmmm). The official name is The Lobster Shack at Two Lights because it is in an area of Cape Elizabeth that is sandwiched between two lighthouses. Lobster has been served in this spot since the 1920’s when it was called the Lobster Shop. The current owners took over in 1969 and changed the name over to the Lobster Shack. The Lobster Shack is similar to most summery fish shack spots in that it is low key and casual. You get in line and order then pick up your tray of tasty seafood when your number is called. What really adds to the experience here is the atmosphere. It is a BYOB spot with picnic tables that are on a peninsula looking over the Atlantic. What could be better? It’s a true New England gem.